In an major decision yesterday, the U.S. Supreme Court struck down the Bush administration's plan to conduct trials of accused Guantanamo Bay prisoners utilizing military tribunals. The decision has wide political and legal implications, and may well bring into question the legality of other controversial Bush administration measures, including a programme of domestic wiretapping in the absence of Court oversight. WASHINGTON - The Supreme Court rebuked President Bush and his anti-terror policies Thursday, ruling that his plan to try Guantanamo Bay detainees in military tribunals violates U.S. and international law. The Supreme Court today, by a 5-3 decision (.pdf) in Hamdan v. Rumsfeld, held that the Bush administration's military commissions at Guantanamo (a) exceed the president's legal authorization given by Congress and (b) violate the law of war, including Common Article 3 of the Geneva Conventions which, the Court held, applies to all detainees in any armed conflict, including Al Qaeda members. (1) The Supreme Court held [Sec. VI(D)(ii) of the court's opinion] that Common Article 3 of the Geneva Conventions applies to all detainees captured in military conflicts, including Al Qaeda members or other "enemy combatants," and not merely (as the Administration asserted) to soldiers who fight for established countries which are signatories to the Conventions. Article 3 requires that detainees be tried by a "regularly constituted court affording all the judicial guarantees which are recognized as indispensable by civilized peoples," and the Court ruled [Sec. VI(D)(iii)] that the military commissions established at Guantanamo violate that requirement because they are not regularly constituted tribunals but instead are specially constituted courts in the absence of any emergency. Thus, under the Geneva Conventions, any and all detainees captured in armed conflict can be tried only by a "regularly constituted court affording all the judicial guarantees which are recognized as indispensable by civilized peoples." (2) The Court did not rule on whether it could, in the absence of Congressional mandates, compel the administration to abide by the Geneva Conventions. The Court did not need to rule on this question, because it found [Sec. IV] that the administration was required by Congress -- as part of the Uniform Code of Military Justice ("UCMJ") -- to comply with the rules of law when creating and implementing military commissions. Thus, the Court enforced the Congressional statutory requirement that the administration comply with the rules of law with regard to all military commissions, and rejected any claims by the administration to possess authority to override or act in violation of that statute. (3) The Court dealt several substantial blows to the administration's theories of executive power beyond the military commission context. And, at the very least, the Court severely weakened, if not outright precluded, the administration's legal defenses with regard to its violations of FISA. (4) This decision illustrates just how critical is the current composition of the Supreme Court. The decision was really 5-4 (because Roberts already ruled in favor of the administration in the lower court). The Justice who wrote the majority opinion, John Paul Stevens, is 86 years old, and as Justice Blackmun once famously warned, he "cannot remain on this Court forever." If the Bush administration is permitted to replace Stevens with yet another worshipper of executive power, the next challenge to the Bush administration's theories of unchecked power could very easily result, by a 5-4 vote, in the opposite outcome. (5) Congress can reverse almost every aspect of the decision as it specifically pertains to these military commissions. It could abrogate any treaties it wants. It could amend the UCMJ to allow military commissions with the rules established by the President. It has already stripped the Court of jurisdiction to hear future habeas corpus challenges by Guantanamo detainees, and could act to further strip the Court of jurisdiction in these areas. We will undoubtedly hear calls by Pat Roberts, John Cornyn, Jeff Sessions, Tom Coburn (and perhaps Joe Lieberman?) et al. for legislation which would accomplish exactly that. Nonetheless, opponents of monarchical power should celebrate this decision. 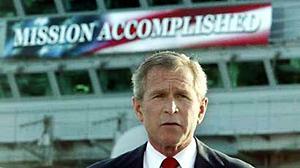 It has been some time since real limits were placed on the Bush administration in the area of national security. The rejection of the President's claims to unlimited authority with regard to how Al Qaeda prisoners are treated is extraordinary and encouraging by any measure. The decision is an important step towards re-establishing the principle that there are three co-equal branches of government and that the threat of terrorism does not justify radical departures from the principles of government on which our country was founded. ... The more I read and think about this opinion, the greater a death blow I think it deals -- at least on the legal front -- to the administration's Yoo theory of unlimited executive power. ... "Whether or not the President has independent power, absent congressional authorization, to convene military commissions, he may not disregard limitations that Congress has, in proper exercise of its own war powers, placed on his powers. Whether intended or not, that paragraph, by itself, dispenses with the central misconception -- the myth -- most frequently relied upon by Bush followers in defending the administration's violations of FISA. Specifically, they assert that cases which, pre-FISA, held that the President has inherent authority to eavesdrop mean that Congress cannot regulate that power. But as the Court today explained... the President "may not disregard limitations that Congress . . . in proper exercise of its own war powers" imposes. That principle is based upon "the powers granted jointly to the President and Congress in time of war." Thus, even if the President possesses the power "absent congressional authorization" to, for instance, eavesdrop (or torture people), "he may not disregard limitations that Congress" imposes on such powers. determinations as to any terrorist threat, the amount of military force to be used in response, or the method, timing, and nature of the response. These decisions, under our Constitution, are for the President alone to make. ...Just as Congress denied the President authority to create military commissions which violate the law of war, so, too, has Congress denied the President the authority to eavesdrop on Americans without warrants (and to torture detainees, etc. ), and -- just as is the case with military commissions -- there is simply no legal justification for the President to ignore those laws. Bruce Springsteen is now touring to promote his new album, We Shall Overcome: The Seeger Sessions, which features a collection of songs written by American folk legend Woodie Guthrie. 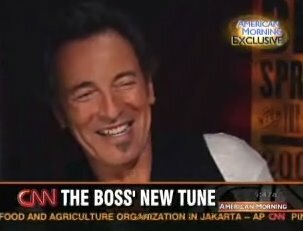 See this video post of Springsteen's interview on CNN today. As always, Bruce is pretty straight-forward about his political opinions. Challenged about his previous comments that America would be well-served if George Bush was replaced, Springsteen replied, "that's just called common sense. I don't even see that as politics at this point... You take a country like the United States to a major war on circumstantial evidence - you lose your job for that. That's my opinion and I don't mind voicing it." The video runs about six minutes, and also has short clips of new concert footage.